A full-length trailer and new key artwork have been released for Drew Barrymore’s upcoming Netflix comedy/drama Santa Clarita Diet. 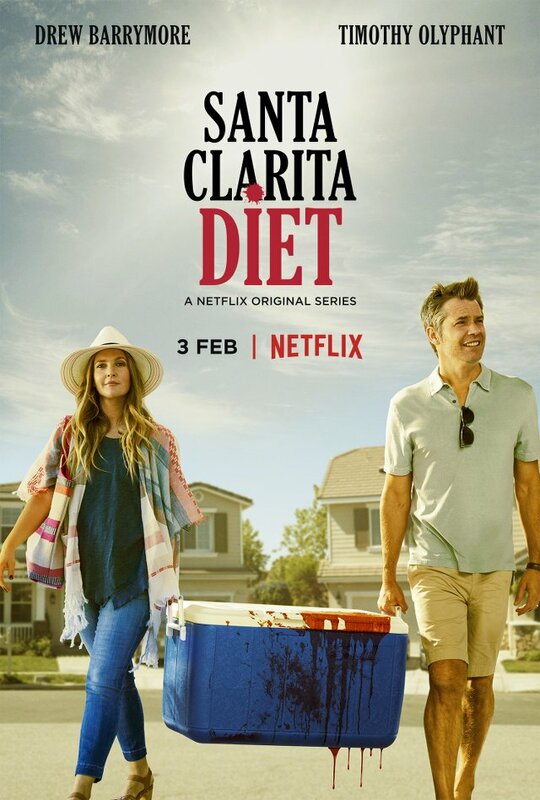 Also starring Timothy Olyphant (Scream 2), Santa Clarita Diet tells the story of Joel (Timothy Olyphant, Justified) and Sheila (Drew Barrymore, Blended), husband and wife realtors leading vaguely discontented lives in the L.A. suburb of Santa Clarita with their teenaged daughter Abby (Liv Hewson), until Sheila goes through a dramatic change sending their lives down a road of death and destruction…but in a good way. When the show was first teased, details were kept tightly under wraps but recently it was revealed that Santa Clarita Diet had an undead twist. From the look of the trailer it’s going to be a fun series with plenty of laughs and blood and gore. The show’s cast also features Liv Hewson as Abby Hammond and Skylar Gisondo as Eric Bemis. Victor Fresco is the showrunner for Santa Clarita Diet. Drew Barrymore, Timothy Olyphant, Aaron Kaplan, Tracy Katsky, Chris Miller and Ember Truesdell are executive producers on the series. Nancy Juvonen is a producer. Santa Clarita Diet is a Netflix production and is available globally only on Netflix on 3rd February 2017.